The Coleman Instant Beach Canopy assembles in three minutes in just three steps to create a shady area outdoors. This canopy cover is made with UVGuard material that offers protection from the sun’s harmful rays and features two-way roof vents to help keep the air circulating when the temperature rises outside. The lightweight pre-attached telescoping poles can be assembled without having to reach over the head, so anyone can set up the tent easily, while comfort grips lock the shelter into place with pinch-free adjustability. 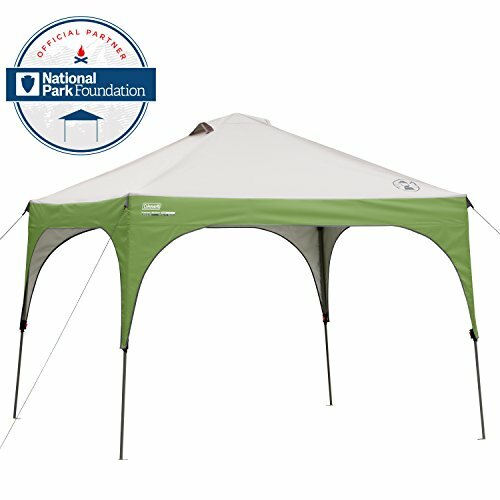 Once the canopy tent is assembled, it offers stable shelter on grass, concrete, and asphalt thanks to its welded steel feet. And when it’s time to pack up, the Coleman Instant Beach Canopy can be stored and transported in the included easy-pull wheeled carry bag, which fits inside most cars.